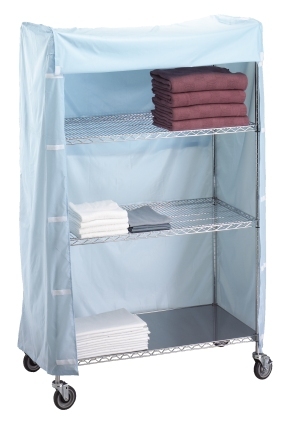 These nylon flame resistant covers provide maximum protection for your fresh linen. Covers are constructed from rugged 200 denier urethane coated nylon which is flame retardant and washable. Closes with Velcro on both sides. 183672C 18" x 36" x 72"
184872C 18" x 48" x 72"
186072C 18" x 60" x 72"
243672C 24" x 36" x 72"
244872C 24" x 48" x 72"
246072C 24" x 60" x 72"
UC1836C 18" x 36" x 42"
UC1848C 18" x 48" x 42"
UC2436C 24" x 36" x 42"
UC2448C 24" x 48" x 42"